How to keep your pup happy and healthy during the dog days of summer. Warmer months don't just bring sunshine—they can also present serious health hazards for our favorite furry friends. "Summer is the busiest time of year in the veterinary ER," says Justine Lee, DVM, a board-certified veterinary emergency critical care specialist in Minneapolis. "Pet owners are jogging, picnicking, and enjoying the outdoors, and unfortunately we see more animals experience trauma because of it." Follow this advice so your dog has a safer summer. Ticks, fleas, and mosquitoes are much more common this time of year, and they cause all kinds of illnesses. “At the very least, ticks leave an itchy bite that can become infected, and at worst they can transmit diseases like Lyme,” says Kathryn Primm, DVM. Fleas leave itchy bites, while mosquitoes may transmit severe conditions such as heartworm, which can damage an animal’s heart, lungs, and arteries if left untreated. Protect your pooch with an oral or topical tick and flea medication for at least six months of the year. Prevent heartworm by opting for a separate oral therapy like Heartgard. Check your pet for ticks daily and watch for symptoms like fever, swollen joints, lethargy, vomiting, weight loss, bruising, and cough, which may signal a tick- or mosquito-borne illness. "Accidental poisoning is common during the summer because people are picnicking and don’t actually know what’s poisonous for pets,” says Lee. If you bring your dog to an alfresco meal, skip dishes with raisins or grapes—both can cause severe kidney injury—or corn, since cobs can get lodged in a pup’s intestines. (And as you probably know, chocolate is a no-no.) If you’re worried your pet has swallowed something toxic—and are OK with a $65 consultation fee—call the ASPCA’s Animal Poison Control Center at 888-426-4435. Add together the outdoor temperature in degrees Fahrenheit and the humidity percentage. "If the temperature plus the humidity is over 150, it’s way too hot to exercise your dog," says Lee. A daytime walk is fine (just stay in the shade as much as possible), but if you want to run or Rollerblade with Rover on a hot day, it’s best to do so in the morning or evening and with a water bottle in hand. If you notice your dog panting excessively or exhibiting dark red or pink gums, it could be overheated. “Those are all signs you need to stop what you’re doing, cool your dog down, and get to a vet,” says Lee, since heatstroke can be fatal in dogs. Try hosing down your dog with cold (not ice) water or offering some H2O to sip on ASAP; then dial your vet. While some dogs live to swim, others, like pit bulls, prefer to stay on dry land. "Don’t force your dog to swim," says Lee. "You can throw toys and see if he goes for them, but don’t carry your dog into the water. 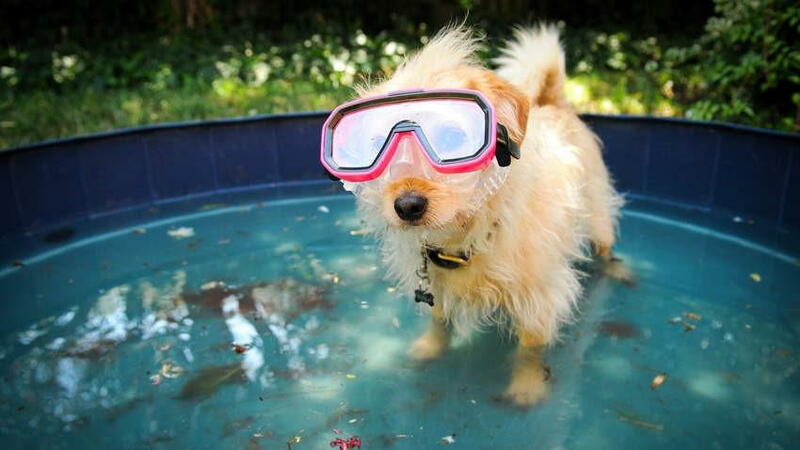 It may make him more fearful.” Worried about your animal’s ability to stay afloat? Invest in a dog life jacket (then take 200 photos of your pup wearing it). You may think you’re doing your dog a favor by shaving it, but fur is actually helpful in the summertime. For one, it keeps them cool. "If you look at fur, there’s both guard hair and longer hair. In the typical dog that doesn’t have curls, there’s an insular layer of air kept above that guard hair,” says Lee. (Think of it like the insulation in your house.) Their fur also blocks rays: Light-colored dogs with pink skin (like a white boxer) are more vulnerable, but any pup risks getting a burn when it’s shaved down to the skin. And fur also protects pups from the elements. A dog’s coat can help curb bug bites as well as any damage to the skin while you’re out and about—say, on a hike—during the summer.